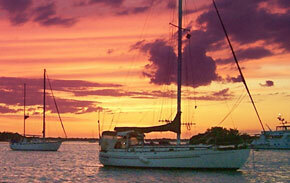 Sailboats anchored in Charlotte Harbor enjoy a typical southwest Florida sunset. Port Charlotte is located on the southwest coast Florida on the north side of the beautiful Charlotte Harbor where the Peace River and Myakka River flow into the harbor. The unspoiled pristine waters of the harbor and the rivers contribute to the area’s natural beauty. Port Charlotte is an unincorporated area of Charlotte County, north of Punta Gorda, with Sarasota less than an hour’s drive to the north. Waterfront homes are common in Port Charlotte, with many canals and waterways offering access to the Gulf from the dock in your backyard. Golfing and tennis opportunities include nearly two dozen golf courses in the county and numerous tennis courts. Local fishing is some of the best in the county, with fishermen targeting the abundant snook, grouper, snapper, trout, bluefish, and many others. Perhaps the best-known game fish in local waters is the mighty tarpon, which can be seen roiling the water at the mouth of the Boca Grande Pass. 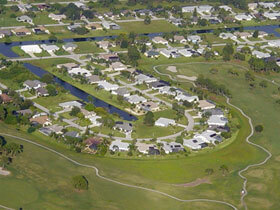 Many area residents enjoy the best of both worlds: A nearby golf course and canal access to the Gulf of Mexico. The Charlotte Harbor area is perfect for boaters of all types, including kayaking and canoeing, flats fishing, sailing, wind-surfing, and just plain pleasure boating. A day trip to Cayo Costa State Park on Cayo Costa Island, accessible only by boat, offers some of the best shelling anywhere, and the restaurant on Cabbage Key is a perfect setting for an afternoon cocktail on the shaded terrace overlooking Pine Island Sound. The large enclosed Port Charlotte Town Center shopping mall, movie theaters and more. The Fishermen’s Village complex on the Charlotte Harbor waterfront just across the harbor in Punta Gorda offers a marina, boutique-style shopping, and waterfront dining. The Charlotte County Airport outside Punta Gorda is the home of the South Florida International Air Show every spring.